July 30th and 31st only - 25% off any single notion/yardage of fabric. This does not include machines and furniture! This applies to in-stock items only - no special orders. So if you need that gallon of Best Press or backing, now is the time of drop by and take advantage of this special. This applies to on line sales as well! WHAT IS NEW AT THE SHOP?!? Wow! We have not communicated since before BU! Soooo lots of new info! 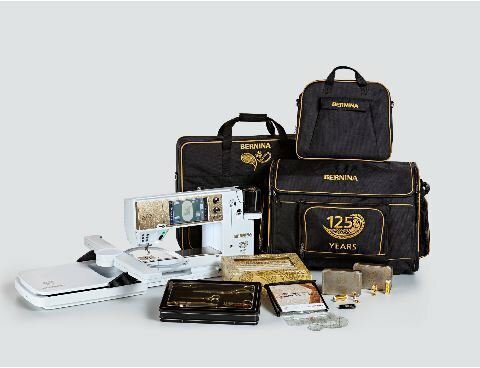 With the unveiling of the 125th Anniversary Edition machines, they bundled a package that includes both cases, an accessory bag, two gold feet (72 Ruler & #1), gold scissors & rotary cutter and much more. Amanda Murphy designed an entire fabric collection for Bernina and right now you can only get it from Bernina dealers (ME! - I have the whole collection!) It is stunning. She also did a collection of quilts for Bernina and will be teaching a block of the month on the We All Sew blog coming in September. 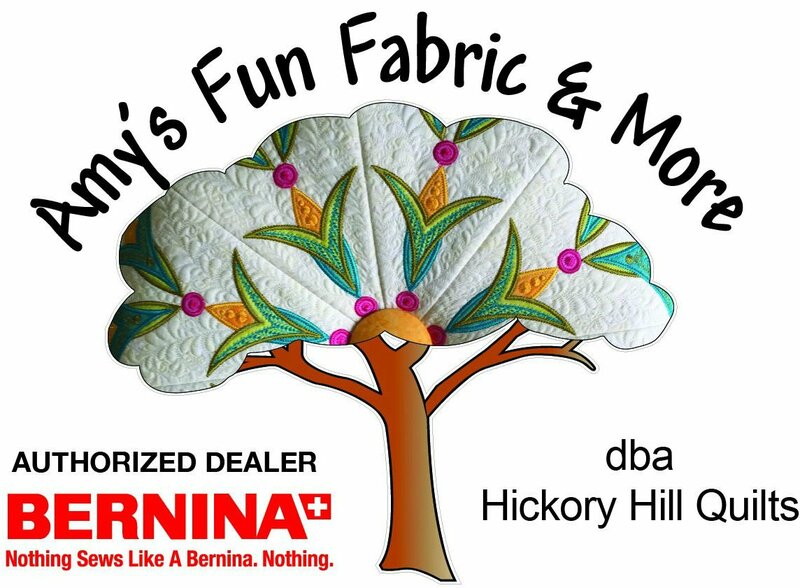 Just for Bernina fans! The bundle include the fabric kit for one of her quilts, the ruler set she made it with and 400+ embroidery designs on the anniversary USB stick all valued at $3,600! If you missed it, we debuted the 2018 Christmas fabric during Christmas in July. I have to say. It is top of the line is all aspects of the different collection. I think the Robert Kaufman is my fav, but every collection from Jason Yenter, Hoffman, Benartex and Moda are equally appealing. I even brought in some Christmas flannel for your jammies and backing! I worked very hard to ensure that these were not run of the mill offerings. Every line unique in its own charm - like the Coke Santa and the delightful Artic Wonderland from Wilmington. It is still not all here! If you haven't been in lately, we have outgrown our space. I have more fabric than we can put on the floor! Fun for everyone coming in, but we are bursting at the seems. We've added the whirley frogs that everyone loves at the entrance. I got my dealership for Premier Kites. We will not be stocking a ton of the designs, but I'll be able to special order anything you want! We have a guy in a golf cart, a frog in a car, nutcrackers, etc. I mentioned that in one of our new classes we will be teaching Anita Goodesign embroidery. I can not offer you any of the Anita Goodesign products and have a good starter selection. 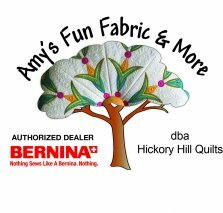 Koala is still our favorite quilt furniture and they are now offering specially designed custom smaller cabinets for Bernina machines. I have the 590 custom cabinet on the floor now for about $1,500. Bernina Academy was a huge success and enjoyed by all and while I was at Bernina University I got to see the new Bernina Academy offering. It is Tame That Technique! I have a date set in April, 2019, so watch for that later in the year. I know this turned into to a lengthy writing again, but I'd rather give you real information that bombard you with junk like other advertisers. I hope you will support the local quilt shops! It is hard to compete with on-line vendors who don't have real "shops". 8/3 - BEGINNING QUILTING STARTS! : This is a thorough, start-to-finish, quilt class. We will start with basic information on choosing fabric and thread, using rotary cutters and rulers, learning how to piece, assembling blocks, adding borders, doing simple machine quilting, and finally, adding a mitered binding. There is some homework between classes, and you should have a completed quilt by the end of class. We will also cover quilting terminology - we do have our own language! 8/7 - LEARN YOUR MACHINE (ANY BRAND! ): Something for all of our friends who need a jump start getting back into sewing! This class is designed to provide basic sewing machine operation and maintenance. If you have a machine that you haven't used in a long time, or is "new to you" (inherited, purchased 2nd hand, or purchased from a source that provides no lessons), then this class may be exactly what you need. We will help you with how to thread your machine, change the needle, fill a bobbin, and show you how to clean and oil it, as well as discuss the basics of how a sewing machine functions. See schedule below. We will be doing partial day, some mornings, some afternoons, even Saturday for the working sewers. This will be a demo session with instruction with you purchasing the pattern (if there is one) and providing the supplies. You must sign up so we know how to prepare for the day and get supply lists out. We hope that those of you who have expressed a desire for sewing training will take advantage of these fun projects along with the Learn Your Machine above. New Embroidery Class - Anita Goodesign - In the hoop quilt - Your choice of Nursery Rhymes or It's A Bud's Life with Susan Kadlubar. Classes will be the second Saturday of the month (Begins September 8th, October 13th, then break for the new year, January 5th, February 2nd if needed). The quilting, borders and embroidery are all in the design. We have a sample in the shop hanging in the classroom. It is adorable! Fractured Star - Two-Day Class - This beautiful quilt adorns our entrance at the shop. It is made with one jelly roll/strip pack and a background fabric. This class is two sessions with a sew day in between in case students need extra help or encouragement to get the pieces done. 9/11 is Day 1, 9/25 is a Sew Day, 10/9 is Day 2 of the class. Judy Bowers will be teaching. There will be no kit unless you request it. Poinsettia - Two-Day Class - This piece can be made round or square (the pattern comes with both setups). It is a stunning table topper. Judy has it made in fall colors in the round and Christmas colors in the square. We will also not be kitting this class unless you request it. DON'T MISS OPEN SEW/POT LUCK! IT IS BANANA SPLIT DAY! PLEASE IN TO LET US KNOW YOU ARE COMING AND WHAT YOU ARE BRINGING! 8/7 – Learn Your Machine – All makes and models – Learning to use YOUR machine. See above.